The “new” 2014 BMW Z4 Roadster details have been announced by BMW and it will come next spring with a few updates for the 2014 model. The selection of driver assistance systems and BMW ConnectedDrive mobility services available on the BMW Z4 have been expanded. The 2014 Z4 also gets three new color choices, new wheels and a new Hyper Orange package. The updates for the 2014 BMW Z4 aren’t all that extensive and are really just a mild refresh for the Roadster. Here are the details on the 2014 Z4. A new Mineral Grey metallic, Glacier Silver metallic and Valencia Orange metallic exterior paint finishes are new for the 2014 Z4, which can only be ordered together with the new Hyper Orange package. If you like orange, this package features a contrast of black and orange. The bespoke Alcantara door panel trim, along with the lower section of the instrument panel, comes in orange. The black leather seats have contrast stitching in Valencia Orange with an accent stripe running down the central section of the backrests and seat cushions. Another exclusive element of the Hyper Orange package is the metal weave trim strip, which can be combined with high-gloss black for the door openers and the gearshift or selector lever. Other new interior additions include high-gloss black surrounds for the central air vents and the iDrive control system’s folding Control Display, which comes as part of the optional navigation system. Fineline Anthracite wood has been added to the selection of interior trim strips available as an option for the new BMW Z4. The 2014 Z4 Roadster gets better when equipped with the optional M Sport package. M Sport includes Adaptive M suspension, 18-inch M light-alloy wheels and an M aerodynamics package with large air intakes in the front wing and a rear bumper inlay painted Anthracite metallic. The M Sport interior features sports seats, an M leather steering wheel, M driver’s footrest, M door sill finishers and an anthracite-colored roof liner. It also includes an Aluminum Carbon trim strip, M leather gear lever knob and grey dials for the instrument cluster lend the finishing touches to the interior ambience. The new BMW Z4 sDrive35is comes with a model-specific version of the M Sport package. The new 2014 Z4 will feature newly designed V-Spoke 18-inch wheels combined with staggered front and rear tire sizes. The BMW Z4 will still be available with the same three powerplants which feature BMW’s TwinPower Turbo technology. The BMW sDrive28i features a TwinPower turbo 2.0-liter four cylinder engine, which produces 240 horsepower and 260 lb-ft of torque. It launches the BMW Roadster from 0-60 in 5.5 seconds with the 6-speed manual (5.6 with the 8-speed automatic) and returns EPA mileage estimates of 22 mpg city/ 34 mpg highway and 26 mpg combined with the manual and 24/33/26 for the 8-speed automatic). 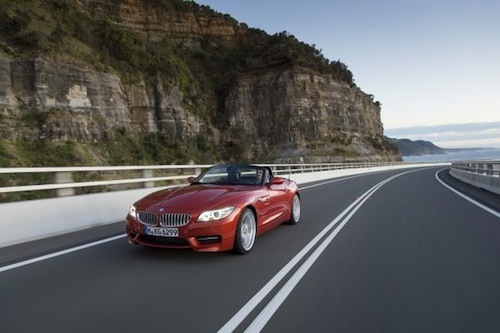 The BMW Z4 sDrive35i features BMW’s N54 TwinPower turbo 3.0-liter inline-6, producing 300 hp and 300 lb-ft of torque. It sprints from 0-60 in five seconds with the seven-speed DCT (5.1 with the 6-speed manual) with EPA mileage estimates of 19 mpg city/ 26 mpg highway and 21 mpg combined with the manual and 17/24/19 for the seven-speed DCT. The top-range Z4 sDrive35is features a high-performance version of BMW’s N54 producing 335 hp and 332 lb-ft of torque and comes mated to the seven-speed DCT. The top Z4 model goes from 0-60 mph in just 4.8 seconds with the same EPA mileage estimates. The range of driver assistance systems and mobility services from BMW ConnectedDrive have been expanded for the new BMW Z4. It can be ordered with new features like High Beam Assistant and Park Distance Control. If the navigation system is specified, the ConnectedDrive Services options allow use of internet-based information and entertainment services inside the car. The new system allows drivers to use BMW apps to receive web radio stations, display Facebook and Twitter posts on the monitor and ask for them to be read out. The range of BMW ConnectedDrive features available for the new BMW Z4 also includes BMW TeleServices, BMW Remote Services, Concierge Services and enhanced Automatic Collision Notification with automatic vehicle location and accident severity detection. Even though BMW is calling the 2014 Z4 "new", there isn't too much to get excited about unless you really like orange. Pricing will be released closer to the 2014 BMW Z4 Roadster being launched which is set for spring 2013 here in the U.S.